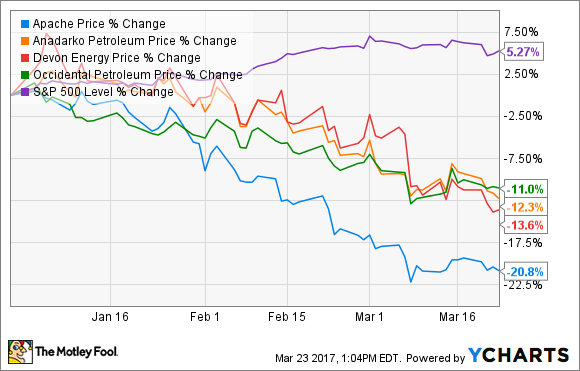 Both oil and gas industry stocks outperformed in 2016. But which driller has the better outlook for investors right now? You can't argue with success, particularly when it comes to oil and gas exploration and production companies. And the stocks of drillers Apache Corporation (NYSE:APA) and Andarko Petroleum (NYSE:APC) both beat the market last year, thanks to a big Permian Basin find by Apache and savvy portfolio management by Andarko. But since the first of the year, both stocks have hit the skids, and are now trading at significant discounts. For investors looking to snap up shares on the cheap, which stock looks like the better buy? Apache's "Alpine High" discovery in West Texas will pay off...once the company gets the infrastructure in place. Image source: Getty Images. Apache's big win in 2016 was the result of some guesswork that paid off handsomely. The company had been quietly buying the drilling rights to a previously unexplored far western part of the oil-and-gas-rich Permian Basin. Before Apache came to town, though, nobody knew exactly what kind of cache was hidden underground. That was good for Apache, because it allowed the company to pick up assets on the cheap. When Apache announced the results of its testing, the result was a shocker: more than 3 billion barrels of oil and 75 trillion cubic feet of natural gas were trapped underneath Apache's 300,000-acre holding, an amount that could support some 3,000 wells. Apache dubbed the find the "Alpine High," and while expectations are indeed high, everything's on hold right now. You see, the lack of previous oil and gas production activity in the region means that Apache is basically starting from scratch. The company needs to build wells to pump the oil, but first needs to complete a pipeline so there's somewhere to put it once it's pumped! A few years down the road, the Alpine High find should contribute significantly to the company's earnings, but until then there's no money flowing in from the field. In fact, money will be flowing out as the company devotes nearly a sixth of its budget to developing the field! This could be good for long-term investors who are willing to be patient for a couple of years until the Alpine High oil and gas starts flowing. By contrast, Anadarko has been dealing with areas of proven reserves. And I do mean "dealing." Late last year, Anadarko acquired the deepwater Gulf of Mexico assets from Freeport-McMoRan in a $2 billion deal. That purchase is expected to add approximately 80,000 net barrels of oil equivalent (BOE) per day to Anadarko's holdings. Better yet, more than 80 percent of it is oil, as opposed to lower-margin natural gas. The company estimates this will add $3 billion in incremental free cash flow over the next five years. Paying $2 billion to get $3 billion sounds like a good deal to me. The company hasn't just been buying, though: in January it sold off $2.3 billion of its Eagleford Shale properties to concentrate on higher-margin projects, including its deepwater Gulf of Mexico operations. Normally, we tend to think of deepwater extraction as costlier and riskier than onshore, but Anadarko CEO Al Walker believes these portfolio adjustments will lead to a 12% to 14% five-year compounded annual oil growth rate. Those are impressive numbers, particularly considering that even with its Alpine High find, Apache is only projecting a 10% growth rate through 2018, despite a whopping 50% annual growth rate projection in its Midland and Delaware Basin holdings, in the part of the Permian Basin where Alpine High is located. In fact, Apache CEO John J. Christmann IV predicts that Apache's production "will experience a brief decline before transitioning to a strong growth trajectory around mid- 2017." So what we have here is one company, Anadarko, forecasting strong growth starting immediately, and a second, Apache, predicting a lull before strong growth begins. That's a tough call for an investor to make. That could mean Apache is a better buy for investors right now, particularly as Apache's current dividend yield of 2% is far higher than Anadarko's 0.3%. Assuming Apache doesn't slash its dividend -- as Anadarko had to in early 2016 -- the dividend gives investors an incentive to be patient as the company builds out its Alpine High infrastructure. However, it's also worth noting that Apache's projected production declines through mid-2017 may cause share prices to drop further as the year unfolds. This one's a tough call, because both companies are anticipating strong futures as long as oil prices remain above $50/barrel. And if prices rise, that's icing on the cake for the entire oil industry. Apache's clear dividend superiority almost tips the balance in its favor, but a 2% dividend yield -- while good compared to most oil producers right now -- isn't quite good enough to justify a win. For right now, I'm calling Anadarko the better buy by a nose, simply because the company has a very clear plan for immediate growth, while Apache seems likely to stagnate for another quarter before beginning to take off. However, smart investors will want to keep a close eye on Apache and be ready to pounce when the company's investments begin to pay off.